Uncle Rod's Astro Blog: Is There Cheap and Good? Is There Cheap and Good? When it comes to eyepieces? If you read the last installment of the Little Old Blog from Possum Swamp, you’ll recall I spent that one pontificating about what a Novice needs to begin a stroll down the path to amateur astronomy fulfillment. I talked about almost everything except eyepieces (“oculars”). I believe that is an important enough subject that it deserves some in-depth discussion in my breezy way. The question Jane Newamateur invariably has is: “How expensive is a good eyepiece, and what’s a good eyepiece, anyway?” Actually, I have a sneaking suspicion that there’s enough confusion about today’s ocular scene to mean some of you not-exactly-novices out there might also want to keep reading. What is a good eyepiece? I could go on and on all day jawboning that—within the limits of my paltry optical knowledge. I can distill what I know down to a paragraph or three, though, which should be good enough for novices and us “casual astronomers.” What you want in a good eyepiece is good eye relief, good field edge sharpness, and good apparent field. “Wut’s ‘eye-relief’,” you ask? That’s easy; it’s the distance you can hold your eye from the ocular’s “eye lens” and still see the whole field of view. How much is good? For an eyeglass wearer, anything less than 15mm means not being able to see the entire field circle. Because of the glasses, the wearer’s eye will be positioned beyond the eye-relief “limit” and the field will be cut-off, “vignetted.” Even if’n you don’t wear eyeglasses, you will find that more eye-relief rather than less is more comfortable. Who wants to jam an eyeball up against an eyepiece lens? Surprisingly, there can also be too much of a good thing when it comes to eye-relief. Get in the 20 – 25mm range and eye positioning becomes difficult and annoying. Field edge? That’s the bugaboo for many folks. It’s easy to describe the problem: “What good is having a wide field eyepiece if the stars at the edge of that field look like dadgummed comets instead of pinpoints?” The other part of the equation is that, no matter how good the eyepiece, “fast” telescopes, those with short focal length/low focal ratio mirrors or objectives, will suffer from a bad case of cometitis. An expensive eyepiece may be better than a cheap one, since it will correct for some edge-destroying problems, but a fast scope—one in a focal ratio of f/5 or faster--will still display a less good field edge than a slow one (an f/10 SCT, for example) eyepiece for eyepiece. The addition of coma correctors and field flatteners can fix the field edge of an expensive ocular at the cost of adding and paying for more glass. No matter how many super-duper correctors you add to the light path of a cheap ocular, though, the edge will still probably look purty yucky. Often because of astigmatism. The most deviling optical quality problem an ocular can suffer is astigmatism. It can make stars all across the field look less than sharp, but those at the edge will be will be especially horrible. Unfortunately, astigmatism is a common ailment of the el cheapo oculars. The field centers of many inexpensive eyepieces are quite passable, however, so The Stig is not necessarily a deal breaker. “Apparent field” is a confusing concept for Newbies, I reckon. When I tell you my Ultra-Super-Mega field eyepiece has an apparent field of view (AFOV) of 80 degrees, I don’t mean I’m taking-in an 80 degree swath of sky; I mean the eyepiece field circle subtends 80 degrees in my view. Still confused? Think about it this way: using an eyepiece with a large apparent field as compared to one with a small “AFOV” is like watching The Beverly Hillbillies on a 60-inch LCD instead of a 12-inch portable TV. An 80 degree AFOV eyepiece will also show more “true field,” actual sky, than a narrow field eyepiece in the same scope, too, but it will not be 80 degrees worth. How much field makes a wide field? My ciphering says a “wide” (aka “ultra wide”) is 100 – 80 degrees, a “medium is 60 – 70 degrees, and a narrow is 55 degrees and below. Big AFOV is always good, right? Not necessarily. If, as above, there’s not enough eye-relief to let you see all of it, what good is it? Or, if you only look at planets, why waste money (more apparent field usually means more $$$) for unused empty space? Bigger AFOV, as long as there is the eye-relief to go with it, is always good for Dob users who must nudge the scope along. Wide AFOV means less nudging, magnification for magnification. That’s as far as Unk’s simpleminded sum-up of eyepiece theory goes. What’s the ground truth when it comes to eyepiece buying? Do you and me and Aunt Jenny all have to spend for Ethoses and Naglers to get a pleasing observing experience? The answer is “probably not.” If you can put up with a less than perfect field edge and a less than expansive AFOV, there are good alternatives. Real Cheap Alternatives. This is the golden age of inexpensive ultra wide and medium AFOV oculars. Depending on your tolerance for comets (and the design of your scope) you can lowball it and still have fun while saving for the Ethos you really want. Or, you may not need to save for an Ethos at all. If you don’t care about AFOV, you can get images that may actually be better than those of the most expensive ultra wides and only spend 50 bucks to do it. I won’t lie to you, though. I have an eyepiece case full of Naglers, Panoptics, and Uwans. And…I’m fixing to add an Ethos to my stable as soon as I can figger out how to sneak one into Chaos Manor South past Miss Dorothy’s watchful eye. Yeah, money is money, but there’s a lot to be said for the old adage, “You can never go wrong buying the best eyepiece you can afford.” You can use a Nagler or Ethos for your whole observing career. Over 40 years, six-hundred Georgie Washingtons don’t seem that bad. Can’t begin to afford a box full of the high-priced spread? A single 13mm Ethos or Nagler might bring more pleasure than a stringerful of Chinese cheap-cheaps. Well I know not ever’body can or wants to pay six-hundred or even three-hundred dollars for a cotton-picking eyepiece. Period. That’s the reason I’m offering choices. If I were to be honest, I’d say that if my expensive eyepieces disappeared tomorrow, I could observe more than happily with any of the following. These used to be the problem children in the bargain basement class, and to some extent they still are. It’s harder to make a sharp ultra wide than it is a narrower AFOV ocular. That hasn’t changed and likely won’t. Even TeleVue has struggled to; for example, bring good eye-relief to the ultra wide. That doesn’t mean you can’t save a little and still get “as good or almost as good” as TeleVue. The William Optics Uwans are not to be sneezed at for sure. I regularly use these excellent oculars and, shoot, a couple of the Uwans are better than the comparable focal length Naglers in my opinion. Downchecks? Just that at this time there are only four Uwan focal lengths and there is no sign WO is going to release more. Ever. The Meade Series 5000 Ultra Wide Angles are nearly as good as the Uwans, and should be considered as well. I’ve also heard some purty good things about Celestron’s new Axiom LX eyepieces, which appear to be similar to the Meades in optical quality and superior to them in mechanical quality. Bringdowns? The WOs, Meades, and Celestrons are cheaper, but not a whole lot cheaper. They go for ½ - 2/3 the cost of the Naglers and Ethoses. Not that there ain’t bargain brigade ultra wides. There are, and the Chinese factories have been pumping ‘em out for about four years now in ever increasing numbers. The best of the bunch I’ve tried are the Bird’s Eyes and the Knight-Owl Ultrawides. Available in focal lengths ranging from 30mm and down to about 11mm, these will make a lot of astronomers happy. No, they are not TVs, but at less than 100 bucks a pop, who would expect them to be? “How good, Unk Rod, how good?” That depends. In my f/15 ETX they are wonderful, in my F/10 SCTs they are very good, in my f/8 Newtonian they are OK, in my f/4 StarBlast they are downright UGLY. Most of this ugly is at the field edge, however, and I don’t know about you, but I spend my observing time looking at what’s in the center of the field. Yeah, I do know some folks obsess about The Edge; if that’s you, go ahead—you ain’t gonna hurt my feelin’s. One thing you fer shure might want to obsess about is ultra wide eye-relief. Check out the manufacturer’s spec before you buy. Many wideuns, cheap and expensive, tend to be deficient in that regard. This is where it gets interesting. That’s because it’s a lot easier to do a 65 – 70 degree apparent field that’s competitive with a TeleVue Panoptic than it is to make an ultra wide cheapun that’s as good as a Nagler (or Uwan). As you might guess, the relative ease of design and good results mean there are lots of medium-wide alternatives out there. On the upper end are Orion’s Stratus 68 degree babies ($129.00) and Astronomics/Astro Techs’ 70 degree Titans ($99.95 and down). The Orions and the ATs are both good eyepiece lines that will not stress out until you get to f/5. Even then, the shorter focal lengths will be useable for many folks. What? You’re a brand new and young Newbie with a houseful of rugrats, a mortgage, and a car payment to deal with first? You need the cheapest of the cheap? Well, I’ve got a deal for you. Orion’s Expanse 66 AFOV oculars might be just the thing. They are cheap ($54.95), and amazingly effective. Only the 20mm model tends to go to pieces in shorter f/l scopes, and then only at f/5 and below. Eye-relief is also decent, with the 15mm being the tightest in the bunch with about 13mm of ER. Let’s say you can live without lotsa field. For whatever reason. Maybe you’re a planetary observer who doesn’t care pea-turkey about Uncle Al Nagler’s vaunted “spacewalk experience.” Or you’ve got a driven scope and think you don’t need as much AFOV as a Dobbie fan. Or you’d just rather have optical quality than mucho space. If any of these things fits, I’ve got two words for you: “Plössl” and “Orthoscopic.” Either of these types of oculars can potentially best the most expensive Uwan or Ethos in image sharpness at the expense of making you live with an AFOV field circle of about 50 degrees or less. Even if you’re a Newbie--the greenest of Newbies--you’ve probably already tried a Plössl, since that’s likely what came with your scope. In the last decade and a half, Chinese optics factories have churned out Plössls in such numbers that these four-lens-element eyepieces have all but sent the ocular that was formerly The Novice’s Best Friend, the Kellner, to the happy-hunting-grounds. The reason? Plössls are good, sharp eyepieces that offer reasonably generous field that hover around 50 degrees, have sufficient eye-relief in anything but the shortest focal lengths, and are inexpensive to produce. Since a Plössl doesn’t have to do the spacewalk thang, its field can be very sharp edge to field edge, even in fast scopes. Also, the fact that they only (usually) need four lenses to do their magic means their views are often brighter and truer in color than the seven-plus-lens-element wides and mediums. Which Plössls? There’s no shortage of brands, but two I can suggest on the lower and upper ends of the scale respectively are the GTOs and the TeleVues. The GTOs (from Handsonoptics.com) range in price from $22.95 to $39.95, and though they won’t break anybody’s bank, do a bang-up job. They are what I use in my binoviewers, since it’s so cheap to acquire pairs. More Better Gooder? The TeleVues. There is no doubt about that. They are sharper, better coated, and mechanically more solid than the rock-bottom squad. The wonderful thing is that this does not come at a huge price penalty. Except for the monstrous 55mm model ($235.00), the TeleVues are all very reasonable at $89.00 to $119.00. Both the TVs and the GTOs are made in a wide range of focal lengths to suit any task. Don’t need even 50 degrees? You’re a Mars Maven, a Jupiter Junkie, a Saturn Sap? I’ve got your eyepiece: the Orthoscopic. 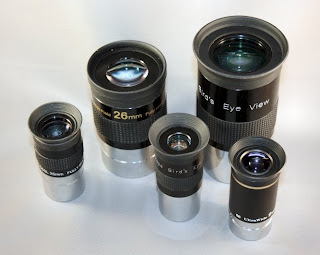 These four-lens-element jobs are what me and my buddies drooled over back in the 1960s but could never afford (TWENTY BUCKS FOR AN EYEPIECE, WAYNE LEE? ARE YOU KIDDIN’?!). They are extremely sharp field-edge-to-field-edge in almost any scope long or short, and are card carrying cheapos in these latter days. The only stop at Bummertown? About 45 degrees is the max AFOV you can expect. So what? When I want to look at a planet I don’t care (as much) about spacewalking and I do not (always) reach for a Nagler or Uwan. I still often use one of my cherished “Circle T” Celestron Orthos from way back when. They are sharp. Here and now? One company’s Orthoscopics stand out: University Optics. Their Abbe Orthos are excellent and sell for a modest $59.95 a pop. Too plebian? University recently introduced a line of “H.D.” Orthoscopics for 20 bucks more each that some folks say do achieve the vaunted More Better Gooder. Me? I’d stick with the originals. They will please (within the limits of their soda-straw-AFOVs). Do watch out for Ortho eye-relief. It tends to be 10mm or tighter in this otherwise sterling design. So, what should Joe or Jane pick out of all these here choices when the most important requisite is “cheap” but good? Depends on Joe and Jane and the scope in question, but, ‘twere it me, I’d go for the Orion (Synta) Expanses if I owned an SCT or an MCT. Oh, if I were feeling a mite adventurous and wanted a taste of spacewalking I wouldn’t hesitate to glom onto at least one Bird’s Eye or Owl. Faster than f/5? Plössls. Let me say that again: P-l-o-s-s-l-s. TeleVue Plössls, if possible. No, you won’t feel like you just stepped out of the Gemini 4 capsule for a look around, but you will be happy, real happy, with the images nevertheless, and, as is the case with any quality eyepiece, a TV Plössl will be something you will find uses for way down the line. Even when you are as old and gray and opinionated and crotchety as Uncle Rod.